Instead, at almost every stage of production, Maker's Mark focuses on quality and personality over speed and efficiency. Is this a great business decision? Probably not, but it is what makes the product one of the finest bourbons that you will ever taste. Our tour started with a walk around the grounds as we were explored some of the historical parts of the distillery, including the Quart House, which is the oldest package liquor store in America. 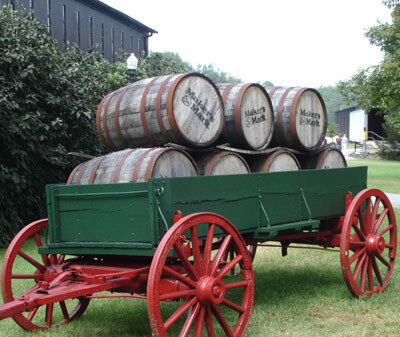 Back in the 1880's local residents would come by on horses and in wagons, with their own containers to buy the bourbon. Also on the grounds is an arboretum that Maker's Mark and the University of Kentucky have put together drawing attention to local trees. As we walk around, it quickly becomes apparent that like the packaging of the bottles, everything is about brand here. The historic nature of the buildings presents an old-timey feeling and the red shutters complete with cutouts matching the shape of the bottle remind you why you are here. Our first stop in the distillery tour is the Still House where we learn that Maker's Mark uses an all wheat mix with corn, instead of the rye that most other distillers use. This leads to a much smoother flavor - think wheat bread vs pumpernickle. Additionally, once again sacrificing efficiency for quality, Maker's Mark uses a roller mill to grind the corn instead of a more industrial solution because it prevents the corn sugars from charring and negatively impacting the taste. The smell of corn, wheat and barley in the Still House presents a delictable aroma that is difficult to describe, but it is a mixture of bakery, brewery, and the good smells of a farm. Next up is a tour through the fermenting vats - 100-year old cypress wood vats where the yeast interacts with the mash, turning sugar into alcohol. In different vats we can see the transition as it slowely turns into distillers beer - a product not far from what we know as beer, but not nearly as tasty. After the fermenting vats, it is time to send the mash over to the still itself where it is distilled into white dog - a clear, high-proof whiskey. White dog is what is poured into barrels in our next stop and will eventually turn into bourbon after several years of aging in American, white oak barrels. Remember before how wonderful the smell was in the Still House? Well when we entered the Rack House, where the barrels were aging it was even better. The smell is referred to as Angels' Share because it is bourbon that slowely evaporates throught he wooden barrels and permeates the room. It is said that this is the angels' share of the bourbon as it rises up to heaven. Once the bourbon is properly ageded 5-7 years (until the Master Distiller deems it ready!) it is time to bottle it up. Once again, quality overrides effiency and Kevin Smith, Master Distiller, was proud to point out that they have the slowest bottling line in the industry. Each bottle is even dipped in red wax by hand. Even the lables are hand-torn, though they use an old off-set printing press with a die cut to make the initial cuts. 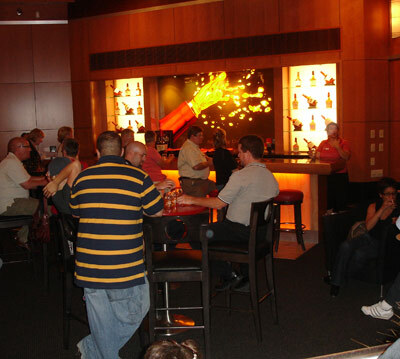 Our final stop on the distillery tour is the visitors center, tasting room, and gift shop. Aside from the tasting, you will want to buy a bottle of Maker's Mark here so you can hand dipp your own bottle as an awesome souviner of your visit. There are also tons of great gift items as well. Maker's Mark distillery is located at: 3350 Burks Spring Road, Loretto, Kentucky 40037 and is open most days from Monday-Sunday. Tours depart hourly. 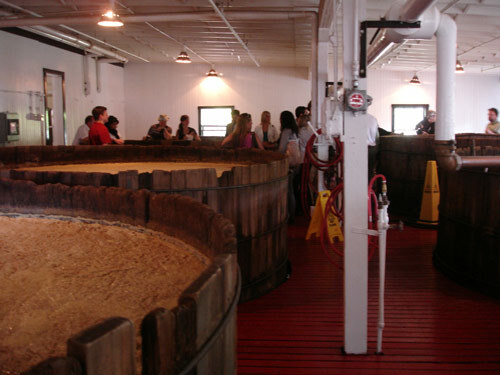 For more information, including tour schedules and hours please visit the Maker's Mark Distillery Tour website. or call: (270) 865-2099.